I’m always trying to get more whole grains into our regular menu rotation and this Mediterranean Quinoa Salad has become a family favorite! I’m lucky that my family loves olives and will eat them in anything. 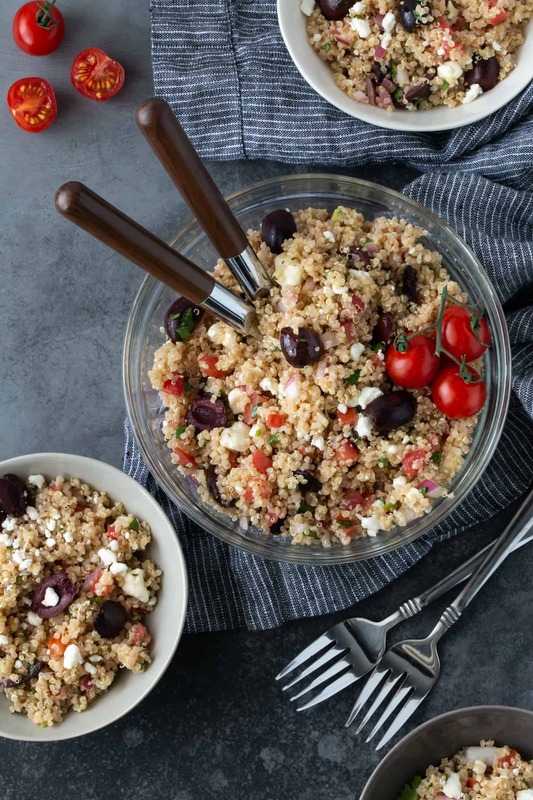 But really, who wouldn’t love a quinoa salad filled with red onion, red pepper, tomatoes, kalamata olives and feta cheese? The fact I can make it ahead of time is just the icing on the cake. 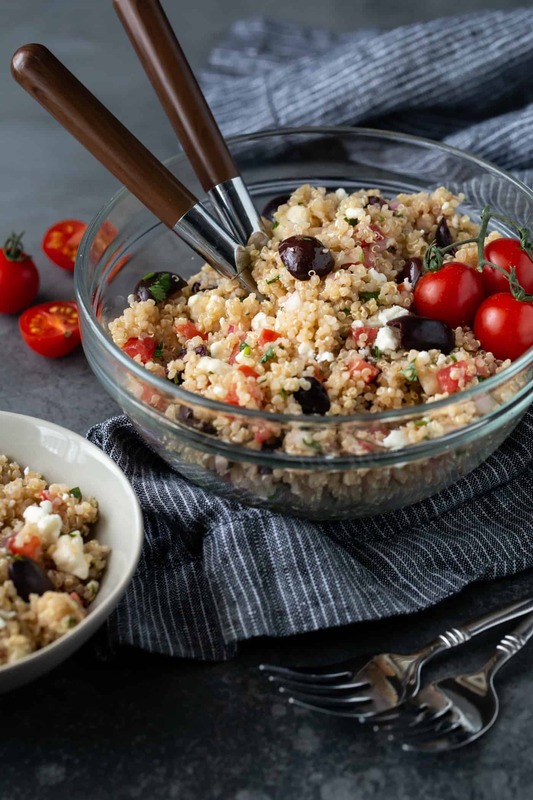 This Mediterranean Quinoa Salad has so many great flavors in one bite and is finished off with a squeeze of fresh lemon juice and cilantro….Delish! Quinoa itself doesn’t have much flavor; it’s what you put with it that gives it the flavor. I’ve found that letting the quinoa cool to room temperature and then adding the red wine vinegar and olive oil before all of the other ingredients really lets the flavors seep into the quinoa. A flavorful quinoa salad can’t be beaten. Serve it for lunch, as a side with dinner or as a quick after-school snack. It keeps well in the fridge and can be eaten at room temperature or cold. All great options when trying to please a family. This salad is super easy to customize for your family. Italian parsley makes a tasty substitution for the cilantro! Don’t have any feta on hand? Use some fresh mozzarella or shredded parmesan instead! Looking for more side dish and salad ideas? Follow us on Pinterest! Follow Garnish with Lemon’s board Side Dishes and Salads on Pinterest. You can never have too many BBQ side dishes! Check out some of our other favorites! 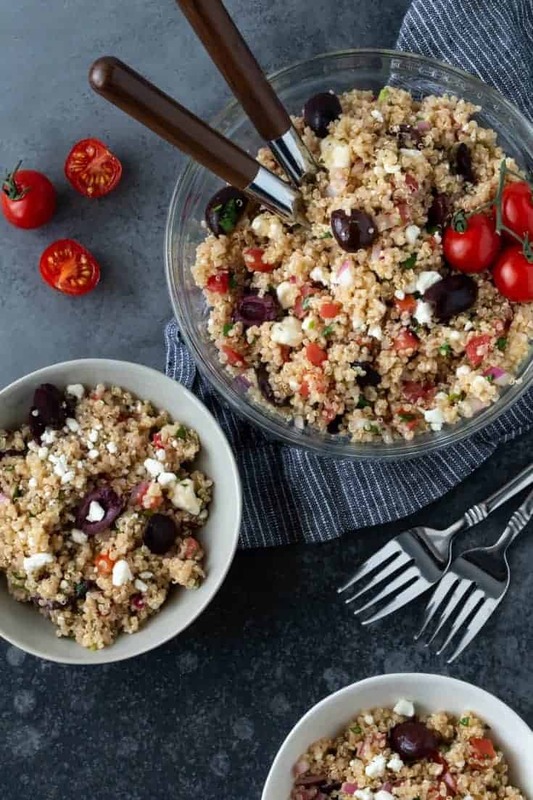 A quinoa salad filled with olives, red onion, tomatoes, and feta cheese. Bring quinoa and water to a boil over medium heat. Reduce to a simmer and cook for 15-20 minutes or until water is absorbed in quinoa. Fluff with a fork and cool for 5 minutes. Add the oil and vinegar and let quinoa come to room temperature. Add onion, tomatoes, pepper, olives, cilantro, and salt and pepper. Stir gently. Add feta cheese and gently combine. Chill for 2 hours to let flavors combine. Squeeze lemon juice over salad right before serving to brighten flavors. I love quinoa. I recently made a quinoa salad but this version looks even tastier. I am so impressed with your blog. The recipes are amazing, as is the photography. I literally read through the whole thing tonight! Keep up the great work! Wow, what a compliment! Thanks so much for your kind feedback! I’m so happy you found us! I made this for dinner last night, and it was amazing! So easy and delicious. Can’t wait to make it again for summer picnics/bbq’s, and impress family and friends. Hi Katie, Thanks! Glad you liked it. It is even better the next day! Enjoy! I found a great grain combo at Trader Joes, actually two that my husband doesn’t complain too much about eating! The first is a brown rice medley with long grain brown rice, black barley and daikon radish seeds. It’s great just served as a side instead of white rice. The second, which I really love, is called Harvest Grains Blend. It has a combo of Israeli style couscous, orzo, baby garbanzo beans and red quinoa. It is delish served hot (cooked in chicken broth) with a good addition of fresh parmesan, or cold as a “pasta” salad. I think it would be great with your greek ingredients. When cooking quinoa I use low sodium chicken stock and dry basil to cook the quinoa in. It adds great flavor to the quinoa. This is the first time I’ve made quinoa and this recipe was fabulous. I’ve already bought the ingredients to make it again! Thank you for this recipe. I’ve been buying almost this exact salad from a stall in our local farmer’s market and I’ve been dying to make it myself because it’s so tasty and healthy. This randomly came up in my Facebook feed today so I can’t wait to try to make it myself. Sorry to take so long to reply. It turned out great. I just popped back to check the recipe as I haven’t made it over the winter but am ready for something lighter like this again and came back to check the recipe before I make it. The version I made was just as good as what I bought so I’m thrilled to be able to make my own. Thanks for the tip! Quick salads are the best! This looks delish! Can it be made a day ahead? Anything you would change in order to do so? Thanks! Yes, it can definitely be made a day ahead. It will keep for a few days in the refrigerator beautifully! What a terrific salad! I adore quinoa!!! I’ve made this dish several times. I love it! Has anyone ever figured out the nutritional information? I’d like to figure out the points for a Weight Watchers. Found your recipe on Pinterest when looking for a quinoa salad to take for work lunches. I made it last night and I am eating the first serving now. I’m not usually one to leave comments but I had to write and thank you for sharing this delightful recipe. It is easy to make and way beyond phenomenal! Thanks so much for sharing!! Hi Danielle, Thank you for taking the time to comment! I’m so happy you like this salad, it’s one of our favorites. Reminds me that I should make it this week! Wow ! This was amazing . I love the Greek flavor. Thanks for sharing ! I’ve made this dozens of times over the years. I always come back to it. I love to make a bowl and use it for lunches over the next few days. Since I like to let it sit, I leave the tomato out. Just because I don’t think it’ll be as good a few days later and also my husband isn’t a huge fresh tomato fan. Today I made it and realized that I had only about a TBSP of red wine vinegar. I subbed half white wine vinigar and balsamic vinegar (not sweet) and it was just as good.